But the challenges I face in getting organized, are often the same complaints I hear from my clients. Your to-do list is unmanageable? Your inbox is out of control? Your desk is swimming in post-it notes? You get distracted by social media and browsing the web? You end up doing other chores when working from home? Since I launched Caerus HR Consulting, I’ve integrated organization and planning solutions to help me stay on track. I ensure my office is organized with an accurate and efficient filing system. I implemented a similar system that I could easily follow for files on my computer. While I know too well how a quick five minute social media break can turn into a half hour browse, after listening to Steve Prentice, author and speaker on the relationship between technology, people, and work—I began to implement many of his tips on time management and productivity. 20% of your time produces 80% of your productivity. So for every minute spent planning, an hour is earned. Always take the time to manage your schedule (see #2 below). Keep 20% of your schedule free for possible contingencies. Plan out and make time for all of the tasks you need to do—including responding to emails, phone calls or even social media. What do you find you waste the most time on? For myself, I schedule time to sift through all emails that come in and ensure I’m following up, even if it’s a simple LinkedIn invite. Schedule time to check and respond to your emails (first thing in the morning, after lunch, and at the end of the day), as well as any other regular tasks. Schedule time to do your work, project by project. Stick to your schedule! Adjust it if needed. Check out the time management grid from Steven Covey, author of The Seven Habits of Highly Effective People, to determine how your schedule should be prioritized. Hang out in Quadrant II (non-urgent tasks). 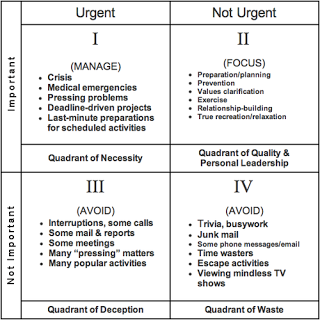 Make time for Quadrant I (urgent tasks). Minimize the amount of time needed in Quadrants III (necessity) and IV (quality and personal leadership). It may sometimes feel like an uphill battle to organize the endless stream of emails or files — but integrating these few tips will allow all of us to make better use of our time, and help our businesses to thrive! Caerus HR Consulting provides HR consulting services to small and medium-sized businesses. For more information on creating an HR strategy through organizational culture and leadership, contact Ramona Packham, Owner & HR Business Partner, at 613-220-9005 or at Ramona@CaerusHR.com for more information. People Business for Business People.